General information: Conveniently located for South Kensington tube. A remarkable act of foresight as the pub was built in 1760. £4.30p for pint of Greene King IPA. No visible price list. No receipt given for purchase of drinks. 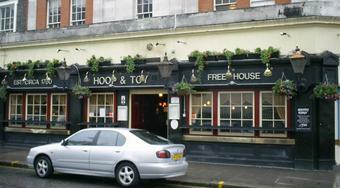 Used to find this a convenient place for a pint before heading for home on the tube. Plenty of seats and stools but you're lucky if you get one as it's always busy. Gents loo upstairs is shabby, smelly and has no hot water. Paid my final visit today. Waited at bar next to a woman who entered just before me. Barman in front of us spent all his time fiddling with the badge on a pump handle, ignored us, bar girl at far end was serving two sets of customers. Her feet must have been glued to the floor, for when she finished with them a couple walked in from the street and she served them straight away. At that point I walked out, and will never return. Went to the nearby Zetland instead, good service and spare seats. This place is a dump and pretty much always has been, too close to the Underground station, but they should be able to make this a real success given the (fairly) recent pedestrianisation nearby bringing in a lot of people. The previous report re: rude staff doesn't suprise me at all. On the plus side, one of the girls who works here has quite the largest assets I've ever seen.